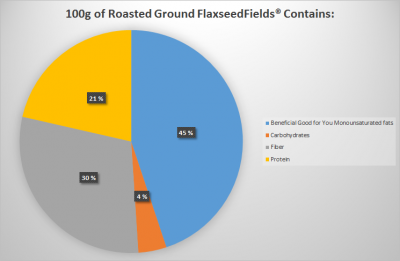 FlaxseedFields© roasted ground flaxseed products contain hight quality plant based protein, around 21% and 30% of dietary fiber. FlaxseedFields© roasted ground flaxseed product contains remarkable amount of magnesium. There is already a fifth of your daily need of magnesium in one tablespoon of the product.